We have some neat New and Used bikes for sale! Here are some examples! This one came in with mismatched steel wheels, cottered cranks, the wrong rear brake and headlight, but really cool racks and fenders. Research showed it to be a 650B bike, so I took some White Industries hubs from Scuba Steve and laced em to VO rims and mounted 37c Pacenti Pari-Motos that fit the fenders perfectly. There was a sale on the ideal IRD crankset. Huret downtube shifters replace Simplex. With the Suntour front derailleur, and a Microshift rear, it makes an attractive 9x2 drivetrain. 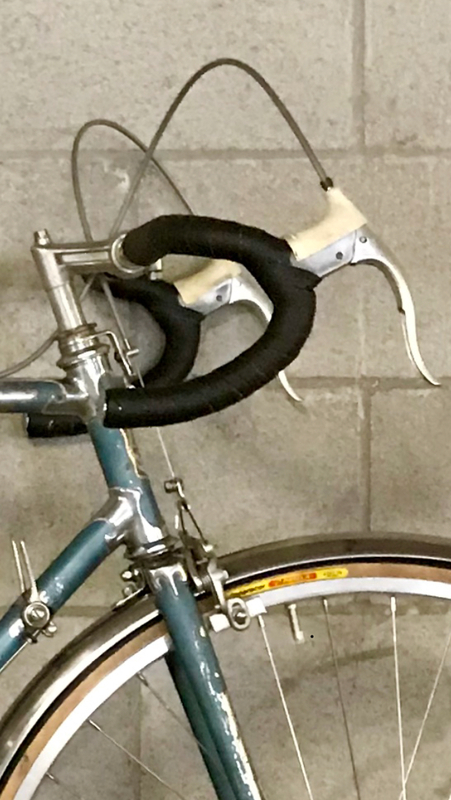 There’s a modern Soma Brevet bar with pleather tape holding Gran Compe brake levers pulling the original Mafac Raid brakes. This one is my holy grail and one that will probably evolve a bit over time. Probably from 1981 and probably made with Reynolds 531 tubes. I traded a 1995 Enduro version of the same bike for this frame and fork. It was originally dark blue and had this repaint in the late 80s/early 90’s era. Most parts are from the 79-83 era. Campagnolo BMX cranks, hubs and headset. Bullseye Rollerbracket. Ukai rims. Cinelli saddle. Nitto stem. Mongoose Pro Class bars. The B-Side is our hardtail frame for 27.5"/650b wheels. This 4th generation B-Side is more versatile than ever. Snazzy Tange/IRD Sliding Dropouts allow you to go single-speed or geared. A modified chainstay allows fiting even some double cranks with "plus size" 2.8" wide tires without needing to invest in Boost parts. We even offer a belt-drive ready version.